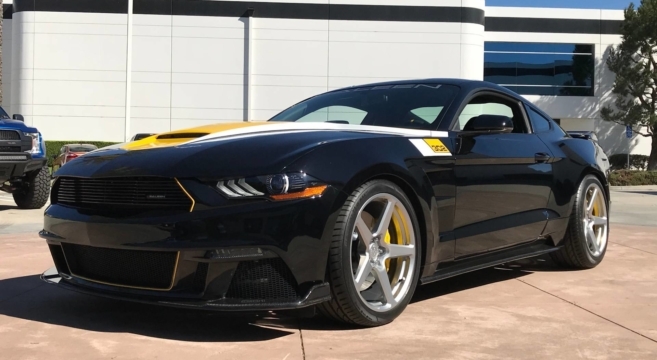 Saleen, which introduces a limited-edition Mustang every five years, has now debuted its 35th anniversary Mustang, a 780 HP 2019 Mustang dubbed the “SA 35.” Only ten SA 35 will be produced. The SA 35 boasts a supercharged 5.0L V8 engine producing 780 HP and 630 LB-FT torque, which is 10 more HP than the standard Saleen Black Label Mustang. Besides the upgraded engine, it also features the Saleen R Code suspension, forged wheels, General G-Max tires and a Saleen exhaust system. It will be painted in the Saleen Racing Heritage colors of black, white and yellow. It will also be equipped with a ram air hood, new front bumper, custom 35th-anniversary fenders, rear wing, special badging and custom interior with customized infotainment splash screen. More pics inside.